The Fort Palace of Neemrana is about 125 km from Delhi, on the road to Jaipur in Rajasthan. 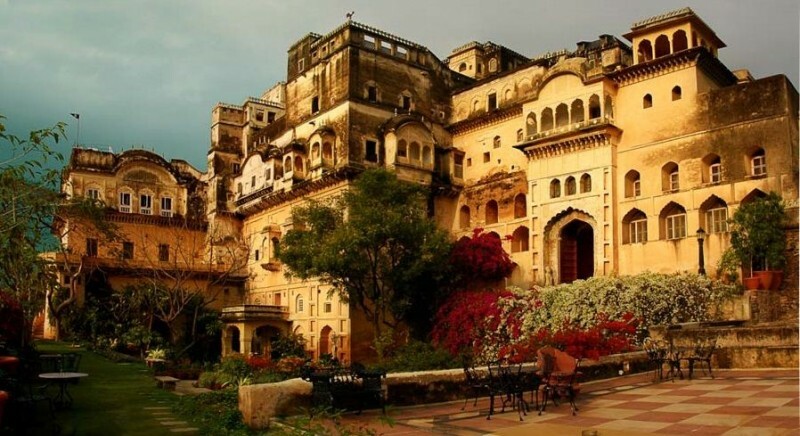 Built in 1464, Neemrana Fort Palace became the third capital of the descendants of Prithviraj Chauhan III, who had fled Delhi in 1192 after he was vanquished in battle by Muhammad Ghori. Neemrana’s rulers, proud of lineage, continued to assert themselves, even under the British, as their kingdom suffered. In 1947, Raja Rajinder Singh of Neemrana moved down to Vijay Bagh and the Fort Palace crumbled as its ramparts began to give way. For forty years he tried to rid himself of his liability but there were no takers. In 1986 the ruins were acquired for restoration and by 1991 the fort Palace was resplendent and majestic once again. The restoration has not tampered or altered any original design feature, not even Windows and doors. 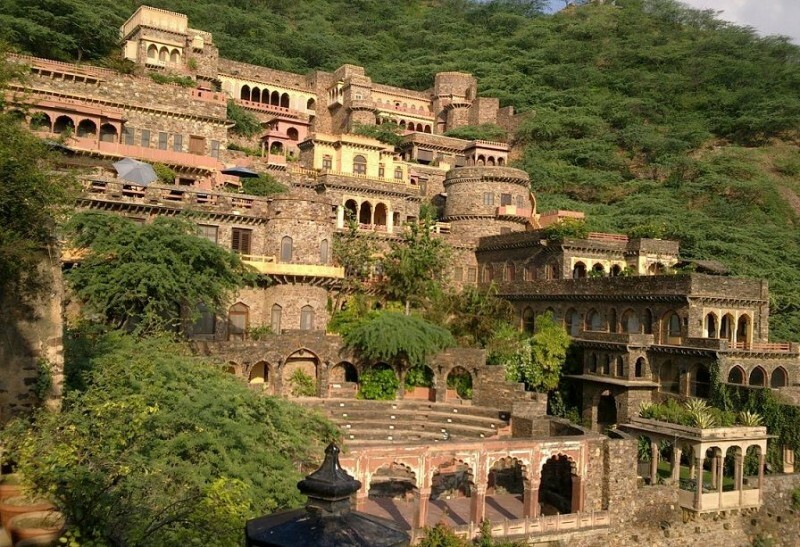 Nowadays, the Neemrana fort is among India’s oldest heritage resort hotels and one of the most unique hotels in the world. The enchanting building, which is located in a hillside to afford the former king views over the nearby village, boasts palace wings covering six acres of land over 12 separate levels – with rooms starting from £50 a night. Though the place appear small, it is a destination in itself. Neemrana fort palace invites the visitors to explore its alleys, balconies, halls, terraces and the history in which it is deeply embedded. As if every stone in wall is a mute witness to the history of this centuries old royal abode. Guests will also be able to learn about the palace’s fascinating history. All rooms inside the former palace have traditional Indian furniture and antiques, boasting an authentic decor from throughout the ages. The Fort Palace retains its charm and names given to its rooms, open spaces and gates by the first royal occupants. The Fort has so much to see that one hardly gets any time to go in for all the other activities. One has to explore the entire Fort to enjoy its past and the restored present. The Fort also has a restored amphitheatre where performances are staged for entertainment of tourist groups. Neemrana has also become an attraction for weddings which can be organized in a lavish way using the amphitheatre and the adjoining gardens and lawns. It surely is a royal way to wed. The 600-year-old Fort-Palace is alive with life today, taking the guests down the memory lane to showcase how the Rajasthan royals lived once upon a time. History is out of the pages on to the hills of Aravali in Neemrana, one has to reach out to feel it. It is more than interesting.